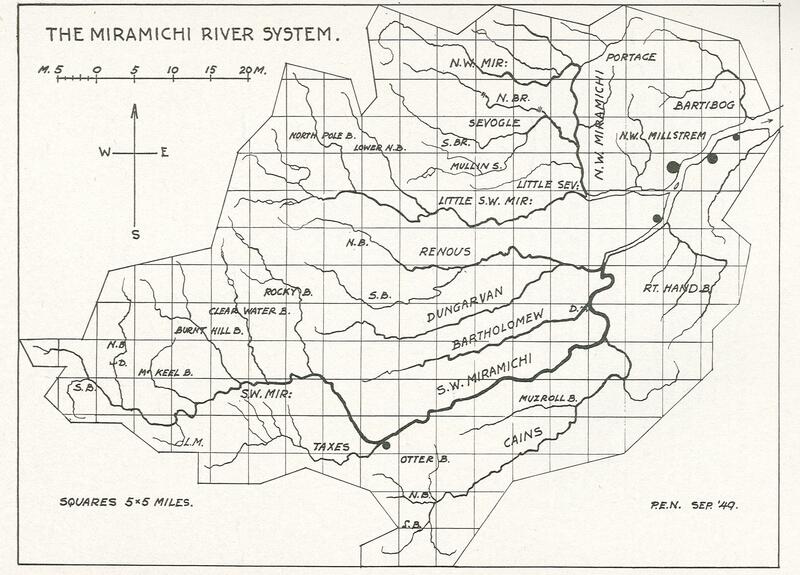 I specify Main Southwest Miramichi because the Miramichi system is one with lots of branches, and many of them are substantial salmon rivers in their own right. While you are still in the brackish portion of Miramichi Bay the river splits into two branches, the Northwest Miramichi and Main Southwest Miramichi. If you look at Percy Nobb’s map of the entire river system –copy included inside Closings – you will see that it is much more complicated than just two branches – there are many tributaries of each – but the fishery on the lower stretch of the Main Southwest is the largest, most famous, and the one that I am most familiar with. 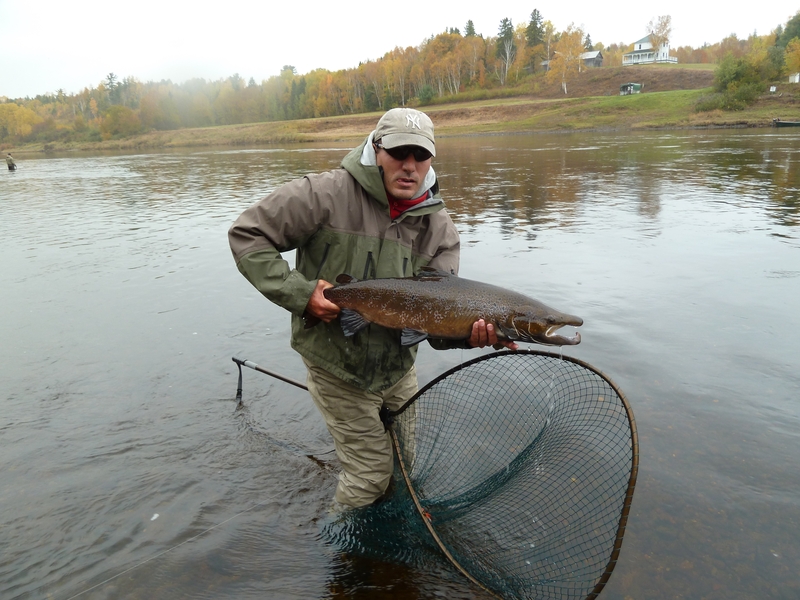 It has long been known, and for reasons not understood by anyone, that the Miramichi system does not begin its salmon run quite as early in the season as some of the Gaspe Rivers like The Matapedia or the Restigouche. Still, any time beginning around Memorial Day you can potentially catch a bright salmon on the Miramichi. The Northwest branch begins a week or so earlier than the Main Southwest. In the Main Southwest this early run is a fishery of the beats between Blackville and Boiestown. The fish can sometimes be found even further upriver, and some people attribute the early run fish to some of the tributaries like Rocky Brook, and these early salmon are commonly referred to as the Rocky Brook run. The early run is almost entirely salmon – as opposed to grilse – and they are all silver beauties, power houses with deep bodies, fresh from the salt and still carrying sea lice. In many years there aren’t a lot of these June salmon, and while salmon catches everywhere were down in 2014 as a whole, from early June on we observed a steady trickle of these great fish moving through Campbell’s and Keenan’s Pool in Blackville – my home water. My neighbor’s pool is a particularly good high-water spot, and several June days that we were in camp a fish or two came off of “Anderson’s Point”. We weren’t as lucky, and rolling and/or pricking a couple were as close as we came. This is in contrast to the same time frame providing us with 19 fish during the 2013 season. Still I don’t think there were less fish in 2014 than in 2013. Some years they just behave a little differently, and success or failure can hang in a delicate balance. Even though these somewhat anemic and sporadic runs normally improve toward the end of June, in 2014 this didn’t happen. In fact the temperature got very warm and salmon fishing ground to a standstill before June was over. But then around the 6th of July Hurricane Arthur arrived along the Miramichi. The valley received almost 5 inches of rain from Arthur, and the river rose nearly 17 feet! Perhaps more importantly it cooled the river water to 59F and it stayed that way for nearly two weeks. By the 9th of July the heart of the summer run started up the river. I arrived on the 10th to a camp with no electricity. We got by with some generator power and going to bed early, tired from casting to, hooking, and playing salmon. These were very predominately grilse, but there were lots of them and they were fresh as daisies, full of incredible energy, and they struck the flies like starving wolves. Being mid-July it became very hot again, and within about ten days the fishing entered the summer doldrums. In the third week in August water temperatures had more or less returned to okay levels, and we started to see moderate but regular runs of salmon. We managed to hook a fish or two most days on the river. We also started regularly finding that a few fish were entering the lower Cains. Fishing was not great, but it was okay; then in mid-September things took an unexpectedly good turn. Mark Hambrook of the Miramichi Salmon Association told me in July that some of the fishery scientists observed that ice conditions in the Straits of Belle Isle indicated to them that things were right for an improved fall run of salmon in 2014. The fall run has become a much weaker part of the entire run than it was a few years back with more of the action coming during the summer period, especially early and mid-July. It appears now that the scientists were right, and in the lower reaches of the Miramichi we had good, moderately low-water conditions to take advantage of the improved run. That is to say that the fall fish never stay put for long periods of time, but in low water they do temporarily hold up in the pools below the mouth of the Cains, whereas in high water they tend to blow through on their way up river. The lower end of our Keenan’s Pool – off Papa’s Rock – is known for holding fish in the fall. Wayne Curtis, a New Brunswick author and guide who grew up on the river, told me that in the 50s it was a place the local men counted on to net their salmon for fall salting. We were very pleased to see that on most days in late September we had a fair number of fish holding in the lower end of Keenan’s. A couple of those days reminded me of times in the early 2000s when lower Keenan’s would simply fill up with fall fish. Campbell’s head guide Jason Curtis tells me about times when he was a boy in the late 1970s, and starting to fish on his own. He drifted down over the prime lower-Keenan lies in very low fall water. It seemed, he said, like there were salmon distributed over virtually every available inch of bottom in the pools. I saw it a bit like that in the early 2000s, but haven’t since then. The government fish trap in Millerton is used to sample and measure the population of salmon entering the Miramichi, and the numbers that they counted during the summer more or less validated what we saw about 20 miles upriver at Campbell’s. The fish in the trap are counted, weighed, measured, tagged and then released daily during the summer. 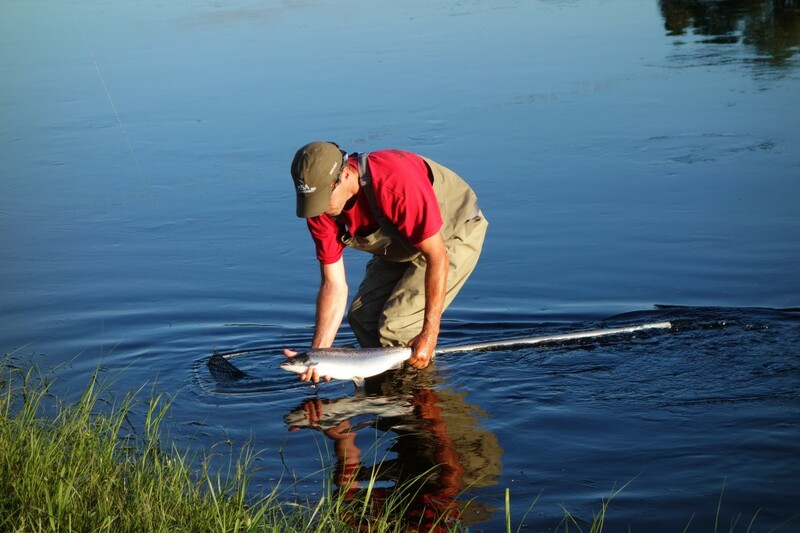 Then pools up river are netted during the fall to gather brood stock for hatchery work. The tagged fish that are recaptured are counted, and the government scientists estimate what percentage of the run is comprised of these tagged fish. The Millerton trap only captures roughly 6% of the run, and the percentage varies year to year depending on a variety of factors. This process allows the government to estimate the total run for the river. The final calculation for 2014 was similar to both 2012 and 2013 showing poor runs of both salmon and grilse, but especially grilse. The Millerton trap – comprised of nets strung along poles driven into the river bottom down in the tidal estuary – was blown out by Hurricane Arthur, and for about two weeks no fish at all were counted. We were on the river at this time, and it was undoubtedly the strongest grilse run of the summer. There were times when we worked down through the three hundred feet or so on the Campbell’s side of the pool and in one pass had strikes or rolls from a half dozen individual fish. On a couple of occasions I had two different fish roll for the fly in the arc of the same cast. Most of these were moving fish, and hook-ups were a small percentage of the casts, but the fish were there in numbers and it continued intermittently from dawn to dusk for several days. If you add a reasonable estimate for this period time the Millerton trap count of grilse would have been much more impressive. There is more that goes in to the government’s estimate of the runs, though, than just the Millerton trap count. The fall grilse run was not nearly this dramatic, it almost never is. The fall is known for large salmon, but there can also be plenty of grilse, and this year we had a good amount of them, especially during the second half of September. The Millerton trap numbers during late September bore this out. Even a conservative addition to the Millerton numbers to account for the two weeks when the trap was not functioning in July would make the grilse and salmon 2014 season numbers considerably better than they were for either 2012 or 2013 though still far below really big grilse years like 2011. So what will this mean for 2015? Certainly the more grilse – grilse are about 85% males – the more likely that we will have a good run of two multi-sea-winter, maiden-spawners during the next year. These are the 9 to 10 pound, super conditioned hen fish that normally make up the bulk of the salmon run on the Miramichi. The thinking is that if good numbers of males survived the first winter, then so will there be a solid number of females surviving the next season. There are no guarantees, but there is reason to hope for a decent run of fish in 2015.